This year we had some cardoons self-seed into a planting box that had asparagus growing in it. 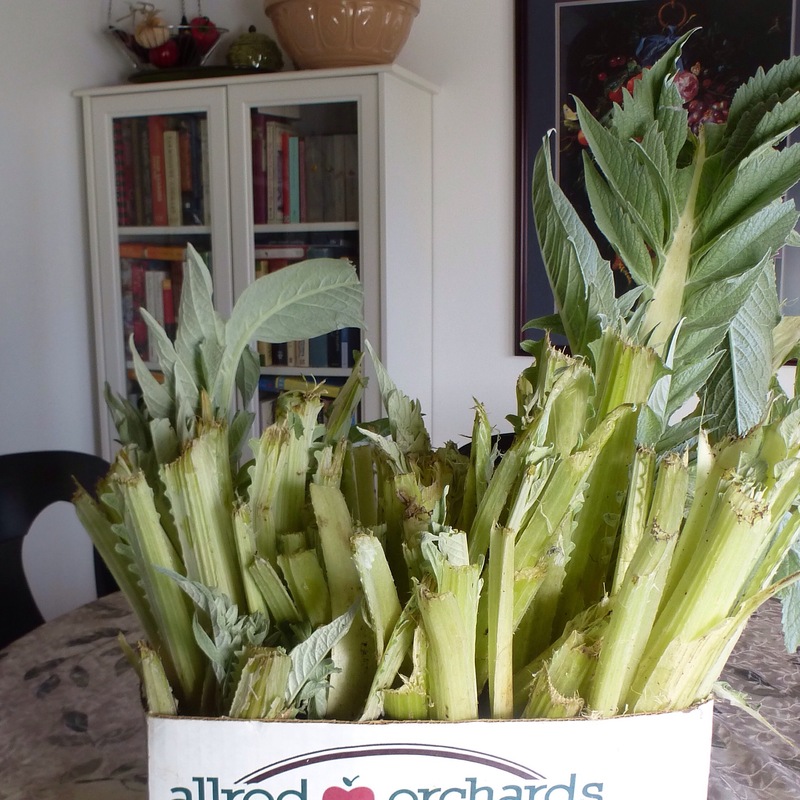 The asparagus did not thrive, but the cardoons loved the container and we had twice the harvest of last year. Cardoons are in the thistle family; they look like celery but taste like artichokes and are a family favorite at this time of year. Most years we have been breading and frying the cardoons using my Aunt Fran’s recipe, but last year we dipped them in a flour batter and fried them. My Aunt Marge preferred the batter-fried method but she never wrote down the recipe. It took some experimenting but I have finally made a light batter that I’m happy with. Batter-fried cardoons have a lighter coating and a nice crunchy texture. You can use this batter for frying other vegetables, too. Begin by cutting and boiling the cardoons. Use lighter-colored stalks. Scrub cardoons to remove all dirt. Cut off leaves and string as you would rhubarb. Cut into 4-inch long by 1-inch wide pieces. They should look like wide celery sticks. Place in a large bowl containing 1 gallon of water mixed with lemon juice to keep them from browning. Bring a 5-quart pot full of water to the boil. Add 1 tsp. Kosher salt. Add cardoon pieces and boil for 10 minutes until fork tender but not mushy. Drain and run under cool water. Let cardoons dry on paper towels. Heat oil in a heavy skillet on medium high heat until it reaches 350 degrees. For the batter: In a bowl combine all dry ingredients. Use a fork to slowly mix in 1-3/4 cups club soda. If the batter appears to be too thick add a little more club soda. 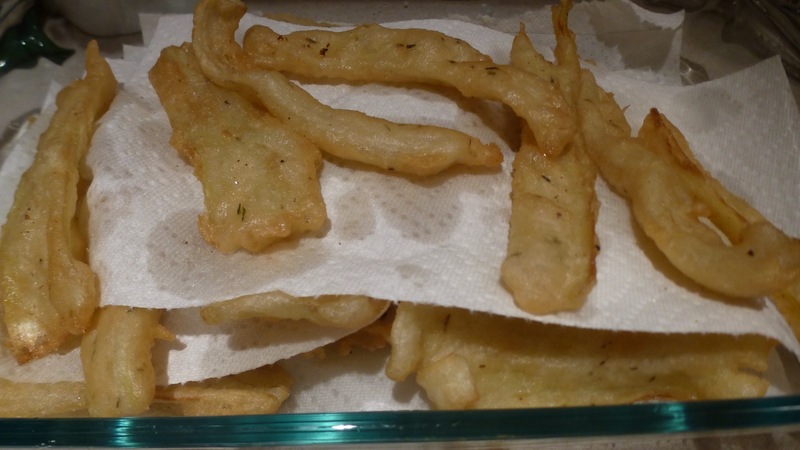 Dip cardoon pieces in batter to fully coat both sides. Fry in hot 350 degree oil 5-6 pieces at a time for 4-5 minutes per side until golden. Remove, allowing excess oil to drain back into the frying pan. Place fried cardoons on a paper towel-lined baking pan to drain. Sprinkling immediately with a bit of extra salt. Serve hot. Serves 6-8. This entry was posted in Appetizers, Christmas, Thanksgiving, Vegetables, Vegetarian. Bookmark the permalink.